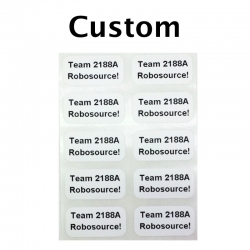 Organize, mark, and manage your VEX Parts with a variety of adhesive stickers, including custom printed options. Stickers There are 15 products. Buy 10 or more of any sticker sheets and automatically save 40% Always know if your motors are in Standard, High Speed, or Turbo configuration! Large type is easy to read. Comes with a sheet of 10 stickers. Each sticker measures 0.5" x 1". Buy 10 or more of any sticker sheets and automatically save 40% Track and identify which port your motors are plugged into. Large type than the connector type is easier to read. Comes with a sheet of 10 stickers. Each sticker measures 0.5" x 1". Buy 10 or more of any sticker sheets and automatically save 40% Track and identify which port your digital sensors are plugged into. Large type than the connector type is easier to read. Comes with a sheet of 10 stickers. Each sticker measures 0.5" x 1". 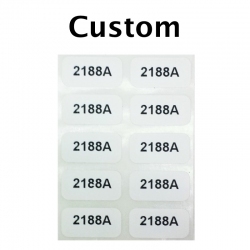 Buy 10 or more of any sticker sheets and automatically save 40% Track and identify which port your analog sensors are plugged into. Large type than the connector type is easier to read. Comes with a sheet of 10 stickers. Each sticker measures 0.5" x 1". Buy 10 or more of any sticker sheets and automatically save 40% When all you need are some adhesive number stickers, with numbers 1 through 12. Comes with a sheet of 12 stickers. Each sticker measures 0.5" x 1". 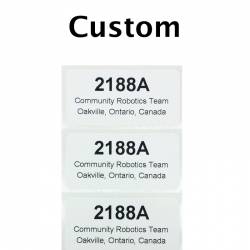 Buy 10 or more of any sticker sheets and automatically save 40% Mark where motors, sensors, or wiring are located in your robot. Includes stickers with Left, Right, Centre, Front, Back, Top, and Bottom. Comes with a sheet of 12 stickers. Each sticker measures 0.5" x 1". Buy 10 or more of any sticker sheets and automatically save 40% Mark where motors, sensors, or wiring are located in your robot's drive. Includes stickers with Left-Front, Left-Center, Left-Back, Right-Front, Right-Center, Right-Back, Left, Right, Centre, Front, and Back. Comes with a sheet of 12 stickers. Each sticker measures 0.5" x 1". Buy 10 or more of any sticker sheets and automatically save 40% Mark where motors, sensors, or wiring are located in your robot's lift. Includes stickers with Left, Right, Centre, Front, Back, Top, and Bottom. Comes with a sheet of 12 stickers. Each sticker measures 0.5" x 1". Buy 10 or more of any sticker sheets and automatically save 40% Mark where motors, sensors, or wiring are located in your robot's intake system. Includes stickers with Left, Right, Centre, Front, Back, Top, and Bottom. Comes with a sheet of 12 stickers. Each sticker measures 0.5" x 1".